Here’s a tea set with attitude! Each an original, these porcelain creations by Parsons Dietrich will start a conversation at any table. 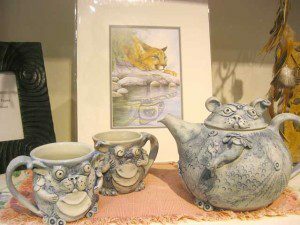 The watchful cougar in the background is one of Sue Coleman’s stunning prints. Visit us to see her cards, prints, calendars, and giclee canvas prints, along with other select artists from Pacific Music & Art.